Bernt Notke is mentioned in about 50 documents. This is an unusually large number compared to many other medieval artists. Unfortunately most of them are court documents where Notke in many cases only appears as a witness and thus they only tell us that Notke was present in this and that city - at this and that time. To sketch out his life then becomes a game of connect-the-dots. 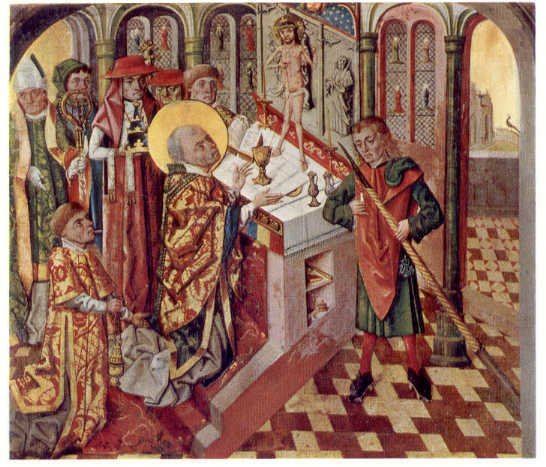 The Mass of St. Gregory in Århus Cathedral by Bernt Notke; click to see the entire painting. The first time Notke was mentioned in any document was in Lübeck 14th April 1467 where he complained to the city council that the painters guild were harassing his apprentices because he was not a member of the guild. On this occasion, Notke produced a birth letter (not a birth certificate) from Lassahn, Pomerania. This does not prove that he was born in Lassahn - only that he knew somebody in Lassahn well enough for them to vouch for him. It's more likely that he was born in Tallinn: Notke is not an unusual name in the Tallinn-area, and a letter from 23rd August 1468 indicates that Notke was related to the Tallinn vicar Diderik Notken. From 1483 he spent some years in Sweden and for a time he was Deputy Master of the Mint in Stockholm. In 1505 he was appointed churchwarden in St. Peter's Church in Lübeck - a position that meant managing the church's tile works, which sold bricks to Scandinavia. 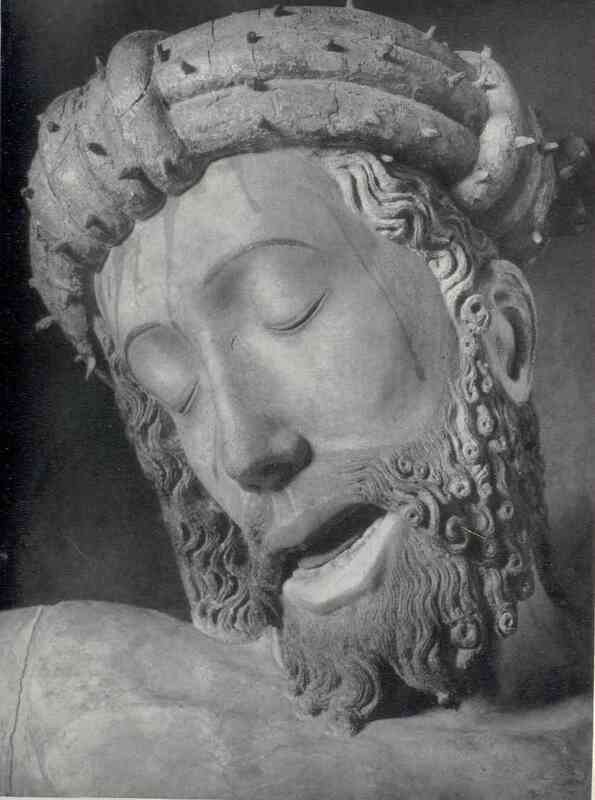 In 1509 he was referred to as dead. 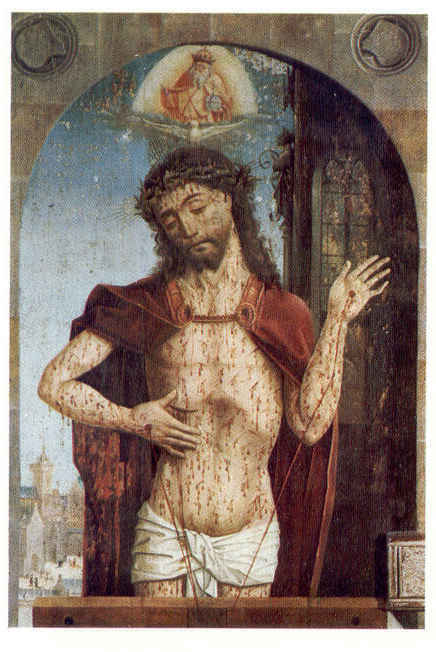 The Man of Sorrows from the High Altar in the Church of the Holy Ghost in Tallinn, click the coloured areas. The High Altar in Århus' Cathedral: We still have a transcript of Notke's receipt for payment. The price was 800 German mark and as a tip Notke was given a horse - worth 20 mark. Thus the price of the altar was the same as 40 horses. The High Altar in the Church of the Holy Ghost in Tallinn: In contrast the handsome tip Notke received in Århus, we have several letters where Notke had to press for the final payment of the altar in Tallinn. 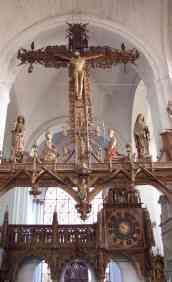 The Triumphal Cross in Lübeck's Cathedral: Inside the figure of John a note on parchment paper was found - telling in plain words that this figure was made by Notke's workshop in 1472. Later some chalk writings were found inside the figure of Mary. These rather illegible scrawls have been interpreted as proof that Notke made Mary as well. 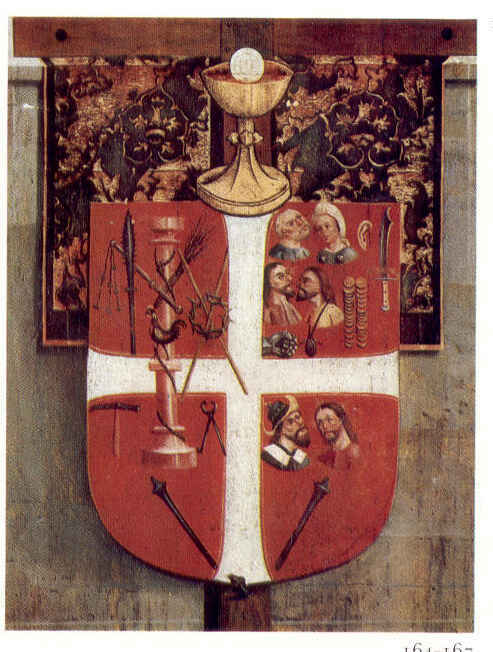 This is a rather fanciful interpretation, but nevertheless the entire Triumphal Cross is usually attributed to Notke. Did Bernt Notke paint the dances of death in Lübeck and Tallinn? Is St. George and the dragon an allegory over the battle of Brunkeberg? Has Bernt Notke created St. George and the dragon? Photos of the painting in St. Nikolai's Church in Tallinn. Is the fragment in Tallinn a remnant from Lübeck? How good a copy was the painting from 1701 of the painting from 1463? Milde's lithographs of the painting.